The development of the Nissan LEAF has an interesting history that's more than six decades long, while some of the prototypes we've seen more recently are giving a hint as to the future direction for the world's best-selling all-electric car. It took over six decades for the Nissan LEAF to be born. During that time, it moved from prototype to limited-production vehicle and back to prototype again, until, finally, the LEAF as we know it was born, becoming destined to dominate the electric vehicle market globally. Now, Nissan is expanding their EV offerings with more battery-driven cars and light vehicles. It began back in 1947, when Nissan built a limited number of Tama Electric Vehicle cars. At that time, with the war just over, oil was hard to come by and alternatives were being explored everywhere. The new Japanese government promoted EVs as one solution. The Tama was noted by the Japanese as being better than its spec sheet would suggest, giving a cruising range of 96.3km and a top speed of 35.2km/h (60 miles and 22mph). It's square shape and large doors made it a favorite for taxi companies. In 1959, a personal EV, the Tama Senior, was also made. It was a more contemporary sedan for the period, with the familiar round-headlight and split window look most of us associate with early Nissan vehicles. The production life of these cars was limited, however, as Japanese trade began to flourish and oil imports became cheaper. Nissan didn't give up on the EV idea, though. In 1970, the company introduced the Nissan 315X concept at the Tokyo Motor Show followed by an odd truck-like design in 1973, the Nissan EV4. The 1980s saw many firsts for electric vehicles, with Nissan introducing many of them. The first induction motor came with the March EV in 1983, a new big-window tour guide's EV was introduced in 1985 as the EV Guide-II with a similar brother, the EV Resort, which went into very limited production for sale to resort hotels. A collaboration with other Japanese automakers in 1988 resulted in the electric Garbage Collecting Truck, sold to cities such as Yokohama. Development continued with the 1991 President EV, Cedric EV (both limited production), and FEV concept. In 1994, the Avenir EV was made and produced for electric power companies. In 1995, the FEV II was introduced at the Tokyo Motor Show and as one of the first concepts to include lithium-ion batteries. Its design was a precursor to the LEAF as we know it today, featuring a sculpted body, flush headlamps, and the absence of a grille as well as a front-mounted charging port. The next year, the Prairie Joy EV was introduced, becoming the first EV to utilize cylindrical-type lithium-ion batteries. It was basically a conversion of Nissan's Skyline-based wagon sold in various markets under different names. That eventually became the R'nessa EV, which was exported to California for field testing as the Altra EV in 1998. The first decade of the twenty-first century saw a lot of electric vehicle development from Nissan, most of which were concepts for car shows. Eventually, in 2008, the aptly-named Electric Vehicle test line began, the first one being a test mule based on the Nissan Cube (commonly referred to as the EV-1). This was the first true LEAF-like EV and was the car most responsible for the LEAF as we have it now. 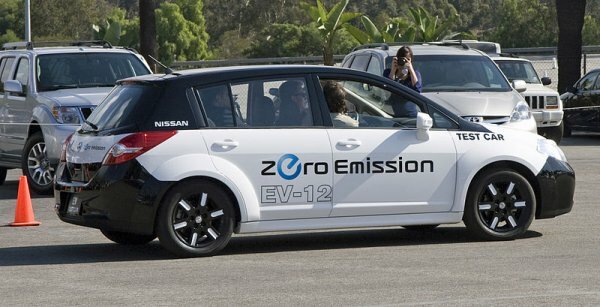 The next year, the Electric Vehicle went into a second-generation, this time based on a Nissan Versa and referred to by Nissan as the EV-12. It's pictured above and is visually the most LEAF-like and was what eventually lead to the LEAF being based on the Versa's platform and chassis. That same year, the first 2009 Nissan LEAF was introduced and began production late in the year for a 2010 sales launch. It entered the Japanese, American, and European markets with huge success. As it grew in popularity, the LEAF itself began to inspire concepts based on its design and powertrain. The Aero Style and LEAF NISMO concepts were shown at the Tokyo Motor Show in 2011 and the LEAF NISMO RC was shown at the New York show that year as well. In 2012, the Infiniti LE was showcased at the New York International Auto Show as a LEAF production prototype for Nissan's premium brand. Nissan says they will begin production once inductive charging standards have been set for the industry, as that is a key intended selling point for the luxury car. Finally, the Chinese version of the LEAF was unveiled at the 2012 Beijing Auto Show and followed on with the production prototype at the Guangzhou show. That car enters production in 2014-15. Pre-production models have been entered into pilot projects in fifteen cities in China. We can infer from the Infiniti LE's design that this more sleek, contemporary look may be the direction that the LEAF will head towards in the future. The LEAF itself will likely see a restyling upgrade in the 2016 model year, if current Nissan cycles are held to the car. What we know we can look forward to, though, is the Nissan LEAF dominating the EV market for some time to come. It's combination of right-pricing, versatility of design, ergonomics, and regionalized production all come together in a winning package.